Stade Armand-Cesari is the home stadium of SC Bastia who currently ply their trade in Ligue 1, the top tier of French football. Originally opened in 1932, (which is a long time ago..) the stadium now has the capacity to hold 16,000 football fans per game. The grounds claim to fame, is hosting one leg of 1978 UEFA cup final match between Bastia and PSV Eindhoven. 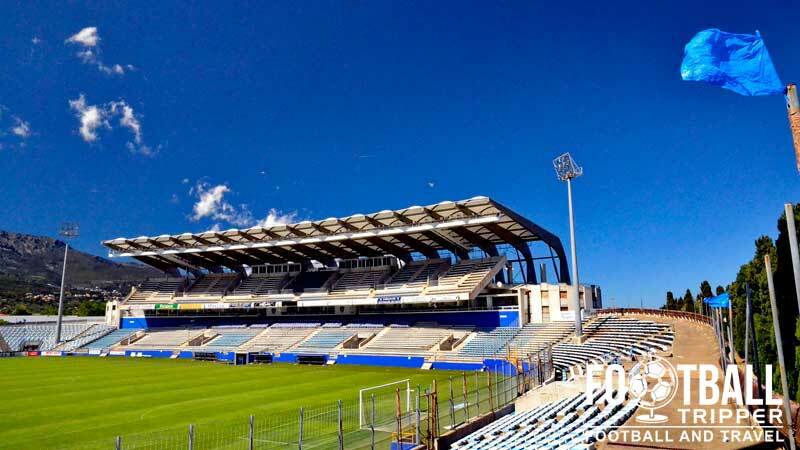 Stade Armand Cesari has been the home of SC Bastia for over 80 years with the club moving to the stadium in 1932 with the inaugural match held on the 16th October against an unrecorded opponent. For much of its history Armand Cesari has remained a very intimate arena with an initial capacity of a few thousand, and even today it is one of the smallest stadiums in France for a Ligue 1 team. In the 1977/78 Season Bastia defied all odds and reached the UEFA Cup final against PSV Eindhoven which saw the packed stadium temporarily increase its capacity to 15,000 following huge demand from local supporters. After the match the new stands failed to become a permanent fixture of the Cesari, and were dissembled shortly after. In 1992 football fever gripped Bastia once again with the club reaching the semi final of the Coupe De France, and due to play Marseille. Club management quickly reacted to the anticipated demand by tearing down the dilapidated North Stand and replacing it with a new temporary scaffold stand similar to those used in Formula 1. 10 Minutes before kick-off on what should have been a joyous occasion disaster struck, with the upper part of the stand collapsing resulting in the death of 18 fans with injuries dealt to a further 2,000. An independent investigation into the incident found the cause to be a mixture of rushed construction, and fraudulent safety testing. Just under 20 years later in 2009, Armand Cesari suffered another disaster with the South Stand burnt to a cinder as the result of an accidental fire, although fortunately on this occasion there were no fatalities. 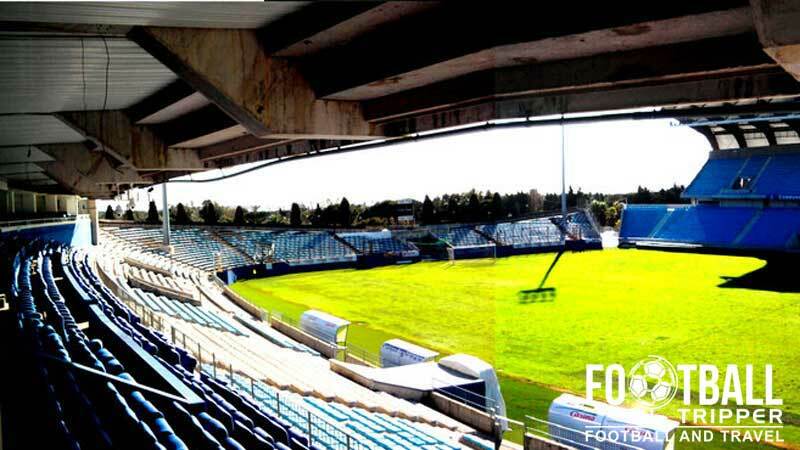 The Stand was reconstructed in 2011 and refurbishments to the North Stand were made, so let’s hope this represents a new era for Stade Armand Cesari. Armand Cesari is comprised of four stands: Tribune Nord – Claude Papi, Est – J Petrignani, Tribune Sud – Victor Lorenzi and Ouest P Cahuzac. It appears that the brave travelling contingent is housed within the Western stand, within a single block towards the tribune Sud. Located miles away from mainland France, Bastia doesn’t really anticipate a lot of away supporters and thus there’s not really a dedicated section per se. There aren’t really any pubs within close proximity to the stadium, with the majority of drinking establishments located back towards the small city of Bastia itself as per the map below. Two of the safest choices outside Stade Armand Cesari are probably Quick (French version of McDonalds) and Flunch (French Grill, sort of like Harvester), but you’re free to gamble and try something which serves the local Corsican cuisine with there being numerous independent restaurants along the stretch of the coast between the stadium and Bastia city centre. Corsican Cuisine is characterised by locally sourced products such as Olives, Chestnuts and Citrus flavours with local farming producing pork sausages and Goat’s milk/Cheese. As an island it goes without saying that fish plays an important part in the local diet, with the consumption of Mussels and Sardines pretty widespread. SC Bastia have a shop located at the stadium next to the club’s trophy room within the main stand in addition to an official online boutique. Monday to Friday 9.00 am – 12.00 pm and 2.00 pm – 6.00 pm. Matchdays: Three hours before kick-off and until the final whistle. For more information and for any queries feel free to send an e-mail to [email protected] The full address is BP 640, 20601, Bastia Cedex. 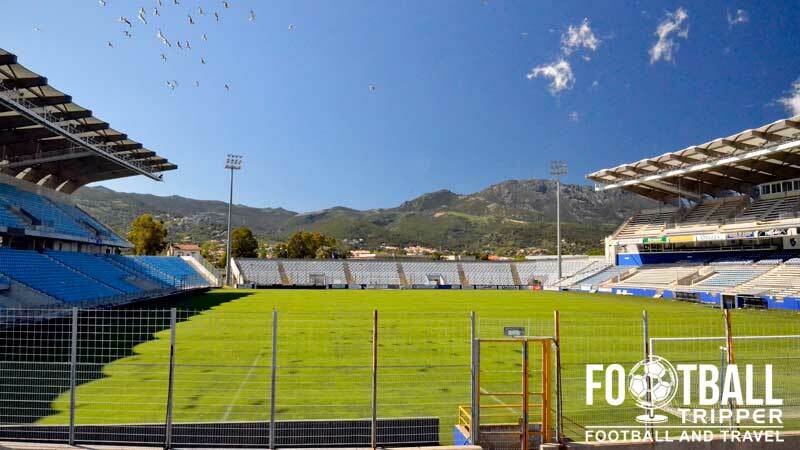 As a ground which opened in 1932 you may be unsurprised to know that Stade Armand Cesari lacks the commercial acuteness of more modern stadia, and as a result SC Bastia do not currently offer tours of their home stadium. 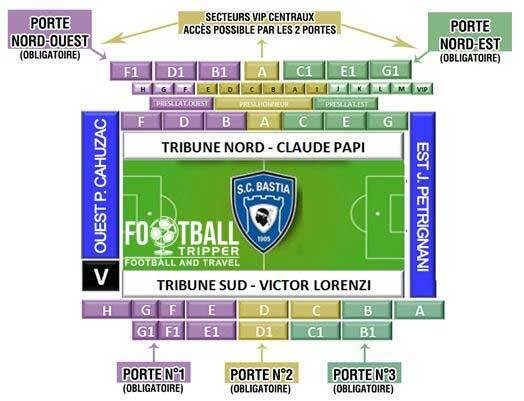 Tickets to see SC Bastia can either be purchased online or in person at the club shop at the stadium on the day off the match providing the games haven’t sold out. There are also a number of ticket vendors around the city with Boutique Alexandre at Port de Toga one such example. Price wise, tickets start at €12.00 for a cheap seat behind the goal, and €20.00 for something slightly better along the side of the pitch, although as the starting prices are low expect to pay much more for upgraded seats closer to the pitch and for the high-profile matches. 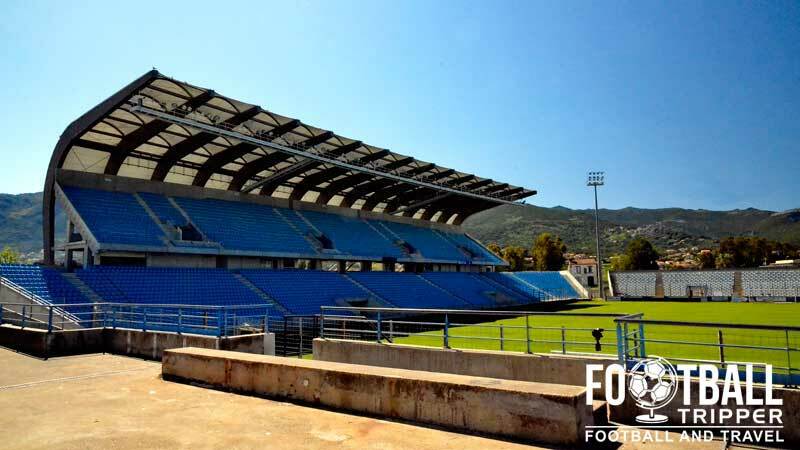 Stade Armand Cesari is located on the Mediterranean coast, approximately 6km southwards of Bastia city centre which is built around the Port. The exterior of Stade Armand Cesari. The stadium and SC Bastia are both pretty small entities compared to other teams in French Football as they are based on the Island of Corsica which has a population of around 322,120 as of 2013. Although you’re highly unlikely to drive to the Island itself, you may opt to rent a car on your travels as public transport can be infrequent and unreliable in Corsica. From your assumed starting place of Bastia proceed along the N193 which is the main and only road which connects the city to the Airport and Ajaccio. There are two medium sized car-parks located north and south of the stadiums behind both grandstands. Alternatively you can catch Bus number 5 which departs from Bastia City centre. Heading southwards in the direction of Furiani, Rustincu stop will leave you will no more than a 10 minute walk to the stadium which is perfectly acceptable. Although an Island, Corsica has a small rail network which totals 232 kilometres in length with the main lines running between Bastia to Ajaccio and Ponte-Leccia to Calvi. From Bastia city centre you can catch the commuter train southwards to Stade Armand Cesari with my estimations putting it at the 9th stop, although counting will be redundant as you will be able to see the stadium on your left hand side – the train station is right next door to the stadium. Ajaccio Napoleon Bonaparte Airport is main flight hub of regional airline, Air Corsica, but Bastia Poretta has grown in recent years with airlines such as Air France and CCM Airlines making it the second most popular airport on the island. As it’s an Island and flying can be expensive we thought we’d include a section on Ferries. From Marseille you can catch the SNCM service to and from Bastia, Ajaccio, Ile Rousse, Porto Vecchio and Propriano with Toulon based Corsica Ferries also offering a similar set up. From Italy you can catch a boat from Genoa and Livorno with both routes run by Moby Lines. The small island of Corsica has lots of choice when it comes to hotels depending on your locational preference. Closest to Stade Armand Cesari you have Hotel Rest. La Bergerie and Pais Cantieri Marie Pascaline, closest to Bastia harbour you have Hotel Posta Vecchia or Hotel Riviera and as an inbetween both you have the popular Sud Hotel.